This is another great post written by Huw Williams, pastor of the International Church in Torino and a close friend of Cor Deo. It was originally posted on Huw’s blog – well worth reading! It is easy to understand the attraction of course, signs offer the hope of communication in a world in which one hasn’t learned to read yet, and as an alien who is still not very fluent in the local language, I can relate well to that feeling. Signs are remarkable things when you stop to think about it – a large amount of important information can be communicated remarkably quickly to the passer by, through the non-verbal creativity of the humble sign-designer. For example, until my daughter caused me to stop and take notice of the list of signs at the bottom of the escalator at our local station, I would not have known that, not only is one forbidden from taking dogs on said escalator, one is also forbidden from walking, running, sitting, or standing with one’s foot too close to the edge of ‘the moving stairs’, as well as from boarding it in bare feet, or accompanying children without holding their hands. All in a few black and white signs, usually with a big red slash diagonally and dramatically drawn, and all decoded in seconds. Signs demand a response and we ignore them at our peril. I must confess to walking (borderline-running, even) on an escalator before now, but now I know that I can’t go running to the station authorities if I fall over doing so again. Ignoring the red stop light at the junction by our house is not something I plan to do any time soon, and it would be likely to end in serious problems if I did. 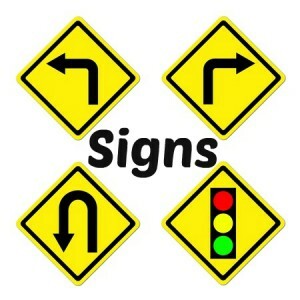 And coinciding with this new awareness of signs has been our Wednesday evening study series in John’s gospel. John is very deliberate in his description of Jesus’ miracles as signs, and this is something we’ve given a lot of thought to. It seems to me that John is very conscious of the difference between seeing or even benefiting from a miracle, and responding to Jesus’s signs. In John’s gospel account we find examples of both – plenty of people accept Jesus the miracle-doer, but not everyone sees the signs and understand what they are communicating. Virtually everyone wants to see the extraordinary, but relatively few follow the sign to respond appropriately to the person of Christ. And this is a tension we have drawn out for us especially at this time of year, when we think of the Messiah riding to his death in Jerusalem on a donkey, the question remains for us – what kind of Messiah do we want, what kind of Saviour are we responding to? – one of our own imagination, or the One he claims to be? When Jesus cleared the temple and was asked for a sign to show his authority, he didn’t refuse to give one, he rather defered it. [John 2] And so we have to ask ourselves, especially appropropriately as Sunday approaches, what are we doing with the sign of his death and resurrection? What response to the person of Christ is it drawing from us? We ignore signs at our peril. Thanks, Huw. This was particularly meaningful to me, given some recent conversations with coworkers. People seem to want a Jesus who will make their lives comfortable—as long as He remains at a distance! May our hearts be soft towards Christ as He draws us into relationship with Him.